So, it’s been 2 years since Snatam released her last major release album, Anand. After Anand, she spent a good amount of time touring. We then released Snatam Kaur Live in Concert and she continued touring. During her tour, she discovered the wonderful news that she was pregnant. She was very busy during her pregnancy! She recorded and released a children’s yoga DVD, Shanti the Yogi, and a chilren’s CD, Feeling Good Today! But then she needed to start to slow down a bit as her pregnacy moved forward, and during that time she began to work on a new album. This album has all of those amazing creative juices that race through the body during pregnancy infused into every note. 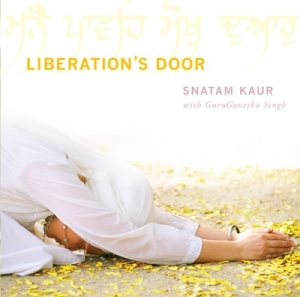 Snatam finished recording right after Jap Preet’s (her daughter’s) 40-days were done. But after she finished her part of the process, that’s when the rest of us really kick into gear to make it ready to share with the world. Thomas Barquee, the incredible producer, brought in musicians from LA to Calcutta to create the perfect support for Snatam’s vocals. Sopurkh, Snatam’s husband and an extremely talented graphic designer worked with Snatam to create this beautiful album cover. We will have this album ready in time for Summer Solstice , but stay tuned you’ll get to hear sneak peeks here over the next few weeks! And I promise, you will be awestruck! please tweet as soon as we can hear the sneak. The most beautiful music which I ever heard! thank you very much!